Danna Lorch: The most prominent feature of Egypt’s graffiti during and following the Revolution were the martyrdom murals commemorating those who had fallen. When did you first see these? Basma Hamdy: The first time an actual Martyr Mural was created was when Ganzeer painted Islam Raafat in 2011. Ammar Abo Bakr was responsible for the most memorable Martyr Murals, the last one commemorating Hesham Rizk in July 2014, a young street artist who was found drowned in the Nile the same month. DL: In your opinion, what difference has graffiti made? 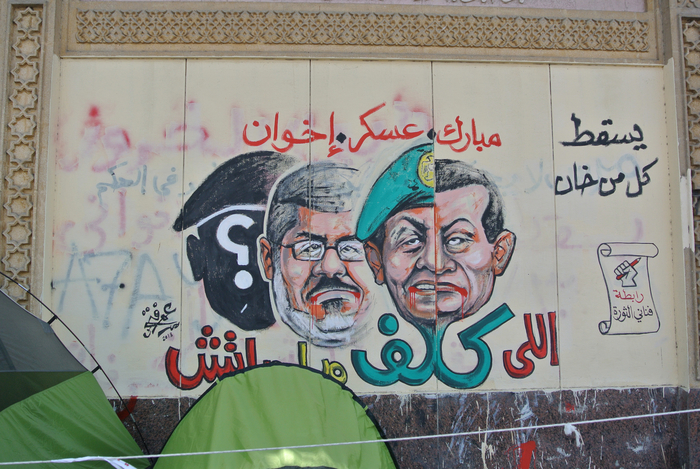 BH: Every historical event related to the revolution was captured on the walls. The walls became the real “newspaper” telling the story of the revolution and reiterating its importance. Don Karl: For me, one of the most striking things I ever saw in relation to graffiti was the powerful way that mothers, siblings, or friends reacted to murals depicting their loved ones, some of whom we describe in the book. DL: Do you believe that street art in Egypt is democratic? BH: I think graffiti in general should be, or is democratic. It stems from the anarchic principle of revolt and rejection of authority. Perhaps in some respects graffiti has lost some of this edge due to commercialization and the entrance of mainstream pop culture. 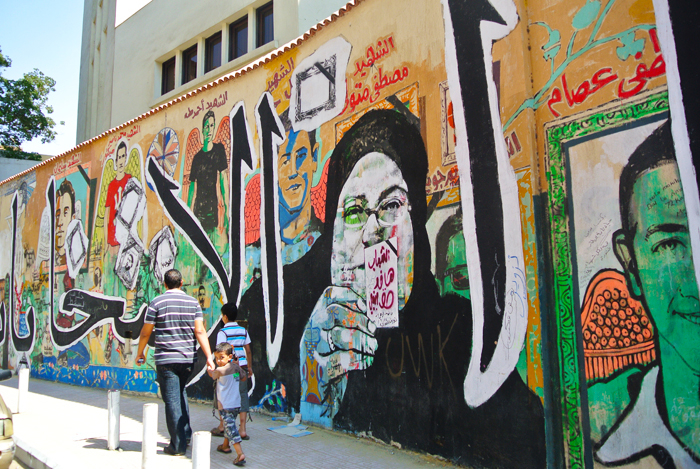 In Egypt specifically, graffiti was created for all people. 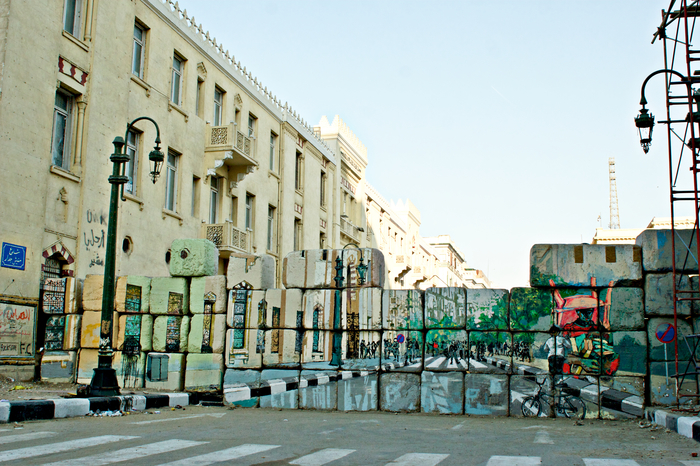 The "No Walls Campaign" visually opened up the barrier walls erected by the military to impede pedestrian movement downtown; the artists used trompe l'oeil techniques to open the wall visually and this was aimed at everyone, from the shopkeepers to the residents. 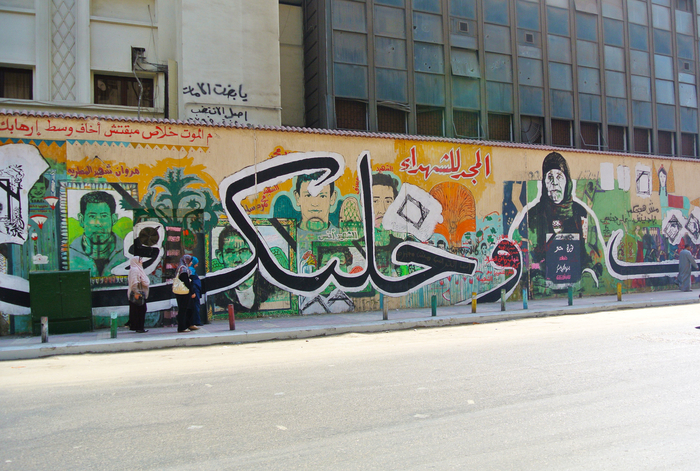 The bulk of graffiti was created in downtown Cairo and a lot of work was painted in Mohamed Mahmoud Street, which is considered the aorta of Tahrir Square. DK: The graffiti of the revolution was democratic in a sense that its role was to capture and carry the mood and grievances of those protesting. It was a direct extension of the chants and wishes of the people. You could see this especially in the very early days of the uprising when it seemed that virtually everyone felt the urge to write his thoughts on the walls of downtown and everything up to the tanks got covered with graffiti. DL: Ganzeer is the artist whose tag has become best known outside of Egypt in association with the street art of the revolution. Why do you suppose that is the case? BH: Ganzeer does not like to be called a street artist and I think that’s precisely why his work is effective. As a formally trained graphic designer, his aesthetic is reminiscent of comic illustrations and pop art, which traditionally challenged fine art and were characterized by graphic work that heavily drew on pop culture and advertising. 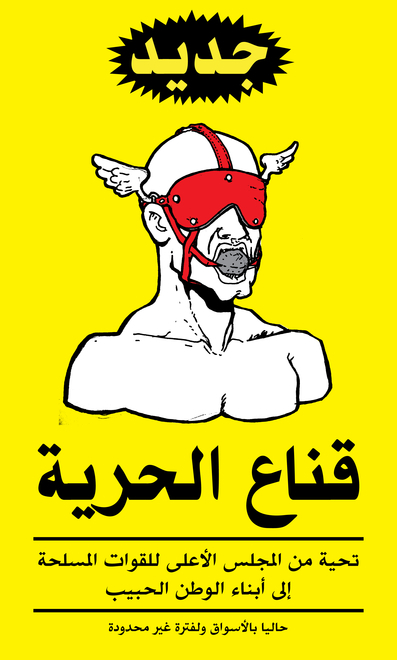 His poster "Mask of Freedom," [shown above] which was later a popular sticker, was a work that earned him an international reputation. The irony in borrowing advertising terminology and graphic design elements to express the human rights violations committed by the SCAF (Supreme Council of the Armed Forces) caused the piece to go viral. DL: What made you decide it was critical to document these walls before they were painted over? BH: Somebody needed to tell the story accurately, truthfully, and from every angle possible. History needed to be documented because we are aware that history is rewritten and fabricated easily in authoritarian states. The visual story of the revolution is an honest one that cannot be fabricated and erased. Thousands of years later we understand the Ancient Egyptians because of the visual legacy they left behind.